No one is expecting the turnout of African-American voters in 2016 to reach the record-shattering numbers of 2008, when Barack Obama lit up the black electorate. But there are critical issues at stake for the black community—the Supreme Court, job growth, health care, criminal justice—with the choice of the next president and other officeholders hanging in the balance. So The Root is joining with its corporate partners, Univision and Fusion, in a companywide effort to increase the participation of African Americans, Hispanics and millennials in the 2016 campaign. At the heart of the effort will be a tool to encourage and facilitate voter registration, knowledge of the issues and, ultimately, vote casting. 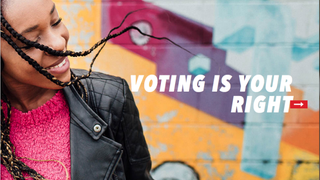 [Univision Communications Inc.] is unveiling the “Vote for Your America” Digital Election Guide, a comprehensive nonpartisan election resource for multicultural and millennial voters in collaboration with Fusion, The Root, El Rey Network and Univision News, among others, and available at YourAmerica.com. For the first time in our nation’s history, this mobile-first website will deliver a complete toolkit to help prospective voters to register, apply for an absentee ballot, find their nearest polling location and learn about their rights as voters. In time for the general election, the guide will also feature nonpartisan details on candidates’ stances on issues important to Hispanic, millennial and multicultural voters. Again, you can access the election guide at the website YourAmerica.com on your mobile device or desktop. We encourage you to join the movement to vote in 2016.